Author Maria Elena Vidal has repeatedly admitted that she called the employers of one of the people who have left negative reviews of her books. She claims she had concerns for her safety and wanted to find out from this person's employers if he had "a history of violence." What this is, is harassment, pure and simple. It is a tactic some unscrupulous people employ when a internet discussion isn't going their way, and someone who disagrees with them won't be silenced by other intimidation techniques. When someone has serious concerns regarding their safety they call their local authorities, or perhaps the authorities local to the other person - if their place of residence is known. They may contact the FBI. They possibly may seek the advice of an attorney. Those are the avenues available to people who feel they may be in danger, and those are the avenues they would take in such a circumstance. Instead Ms. Vidal contacted this person's employer. This is an obvious attempt to retaliate against this person who has displeased her by his voicing his opinions about her books on the internet. It's clearly intended to attempt to cause this person harm with his employers. It's harassment, and it's revenge. No reasonable person would consider this a reasonable course of action, even if one had sincere concerns over their safety. It's ridiculous. It is completely transparent that Ms. Vidal had no sincere concerns in this regard. Because when people do sincerely feel they are being threatened, their physical safety may be in jeopardy, they do not call an individual's employer. Nor is there any legitimate or valid reason to do so. 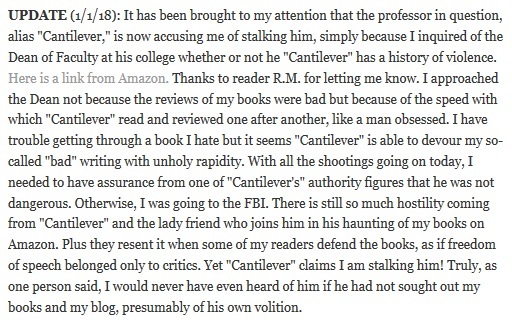 It is obvious to me that Ms. Vidal is hoping this person's employers will either employ economic force to inspire him to remove his book reviews (which could land them in serious legal hot water), or fire him (which could land them in serious legal hot water). She clearly has no effective stick by which to get this person to bend to her will. She obviously is expecting his employers do, and is hoping they'll use it. And now, because readers continue to point out her unprofessional and unreasonable behavior and attitudes against readers who were less than impressed with her books, she once again is threatening to call this person's employer. THAT, Ms. Vidal, is harassment. 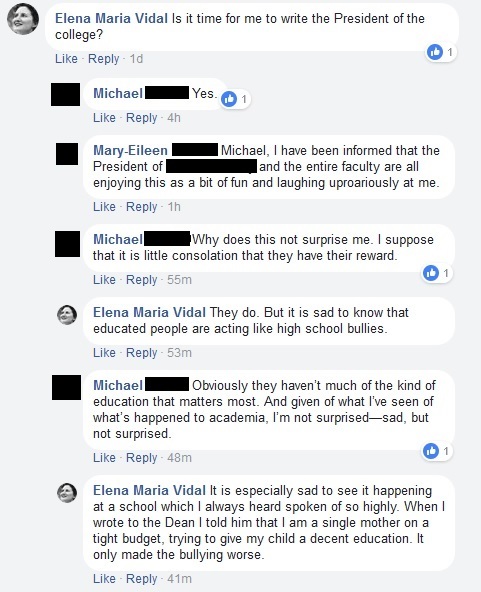 "Mary-Eileen" happens to be Elena Maria Vidal posting under her real name account. The Vidal name is a pseudonym. Because I have more scruples about people's personal information on the internet I have redacted the last name to protect her privacy. Notice here she states, "When I wrote to the Dean I told him that I am a single mother on a tight budget, trying to give my child a decent education." which has absolutely nothing to do with concerns over if someone has a "history of violence", but which does demonstrate her concerns are actually regarding a negative review of her book. As she doesn't mention anything to do with her personal safety, but rather her "tight budget" while "trying to give my child a decent education". Clearly her concerns therefore are not regarding "violence", but her book sales. My advice, write better books, and ensure they actually are historically accurate, and not written in order to serve a particular agenda. Failing that, accept that readers will have opinions about books, and some of them you won't like. That's business.